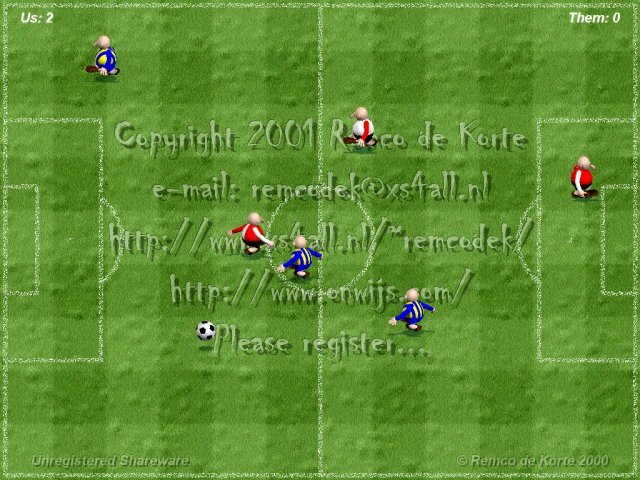 SoccerSaver turns your screen into a soccer field with 3D rendered players running around in an attempt to play a game of soccer. SuperZero, the superhero who also featured in the screensavers SuperSaver, XMasMan and StupidCupid, stars in this screensaver as soccer-sucker-without-a-clue. You can change the players' outfits and choose which teams you want to play against one another. There are also several options to change the appearance of the playing field. - change the appearance of the field by adding lines, bumps or a mowing pattern. - project a message on the grass; you can set the font, alignment and brightness. - keep track of the score. - choose the outfit and names of the two teams. - change and display the names of the separate players. - keep track of the statistics for each player. Note: The demo-version of the program is free and almost fully functional. For more information on Soccersaver and how to obtain the full version go to the Soccersaver-page.